I have a significant amount of presbyopia… that stiffening of the focusing mechanism in the eye also known as Over-40-Eyes. I can’t see small things close up whatsoever. To compensate, I wear monovision contacts during the day. They vastly improve my near vision, but they don’t exactly, shall we say, correct it. When I’m sewing, I put on reading glasses over my contacts, and then I can really see! So I go from two eyes to four eyes to six eyes. Hey, whatever it takes for the sewing! A sneak peek of what I’m using my six eyes for right now. My pal Cathy Perlmutter recently reviewed a geek-chic contraption she swears by, called MagEyes. From the looks of this thing it’s reading glasses on steroids! It was invented by a lady to aid in her hand smocking. Go read Cathy’s hilarious Gefiltequilt post, How You Look vs. How You See. Don’t forget the Dog Cabin special is still on, through Tuesday, January 7, 2013! Maddie, this is one of my favorite pieces of appliqué information to share. It isn’t something that’s typically covered in appliqué instructions, but I’ve always included it in my books because it’s an important piece of the puzzle in getting pleasing results. First of all, let’s start with vision and lighting. Bear with me… it all ties in. For good appliqué results, you have to make sure that your vision is good. Is your glasses prescription up to date? Do you have the proper glasses for close-up work? Take me for example. My whole life I was so proud of my better-than-20-20 vision. But at a certain point, when we got a new computer system at my day job that ONLY printed out in 10 point type, I had to admit that I needed help. I entered the era of reading glasses. Now I could read the computer printouts. But the glasses were such a pain! Put ’em on, take ’em off. Put ’em on, take ’em off. Where the bleep are they?? Argh. 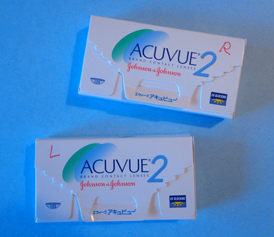 I mentioned this to my eye doc and he told me I was a good candidate for monovision contacts, so I went to see the optometrist and got me some. Hallelujah! Now I could stick the contacts in in the morning and get through the whole day without putting on a pair of glasses! That really improved my quality of life! However, monovison contacts means you have a strong lens in your near eye and a weak lens in your distance eye, and your brain blends the two together. They’re great for general seeing but not so great for very precise, detailed, close-up work. So when I really need to see, I put on reading glasses on top of the contacts! That’s right, I go from two eyes to four eyes to six eyes LOL! Oh well, you do what it takes. You may have a different vision scenario. You need to be able to see the eye of the needle and the grain of the fabric. What I’m saying is, do whatever it takes to get your vision corrected for stitching, and not just at two inches from your face. Let’s move on to lighting. Good lighting goes hand-in-hand with good vision. You need to be able to direct a strong light right on your work. It’ll make a big difference! The reason I bring up vision and lighting is that you need to be able to sew in your lap, not up next to your face. I see it all the time… people bringing their project up close to their eyes, stitching up in midair with the background falling away. This encourages buckling of the appliqué. Put your feet up on a footstool, sew in your lap, and provide support for the background fabric. 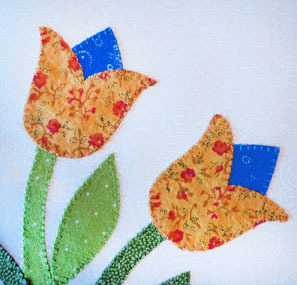 The June Tailor Quilter’s Cut ‘n Press is an excellent appliqué aid. The cushioned side comfortably supports your underneath hand and the project as you stitch. I’d show you a picture of mine but it’s ancient and “well-loved” in its appearance. Mary Warner-Stone feels the same way as I do about the Cut ‘n Press, except I use the smaller square one and she uses a longer one. Check out her guest post, Support Your Work. Maddie, I hope this helps. Let us know how it goes.